Friday night, the curtain was raised on a new Syracuse basketball season at the Carrier Dome. Based on the results, head coach Jim Boeheim may want to take his show off Broadway for a little while for some extra rehearsals. 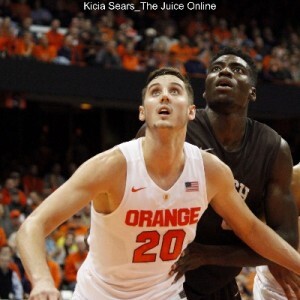 The Orange participated in one of the uglier basketball games in recorded history, but walked away with a 57-47 victory in large part due to their guests from Lehigh providing a slightly larger share of the evening’s unpleasantness. SU did cause some of the Mountain Hawks’ issues, as their 2-3 zone was quite active, particularly in the passing lanes. As a result, Lehigh did not make a field goal for over 16 minutes of the game, bridging the first half into the second. During that span, Lehigh shot 0-for-19 from the field while committing 11 turnovers and making five-of-ten free throws. As a result, the Orange outscored their guests 26-5 and turned a one-point deficit into what proved to be an insurmountable lead. Boeheim also mentioned before the season that this year’s version of his team would have a greater reliance on the three-point shot and that proved to be true. The team’s first six shots all came from behind the arc. 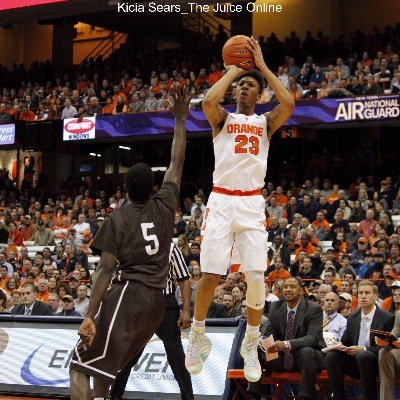 Freshman Malachi Richardson buried his first two tries, giving the Orange an early 6-2 lead. Over the next four minutes and change, Syracuse mustered only a pair of free throws from Michael Gbinije and Lehigh took advantage, scoring seven straight points to grab a 9-8 lead. Boeheim called a time out less than seven minutes elapsed to give his charges some direction. 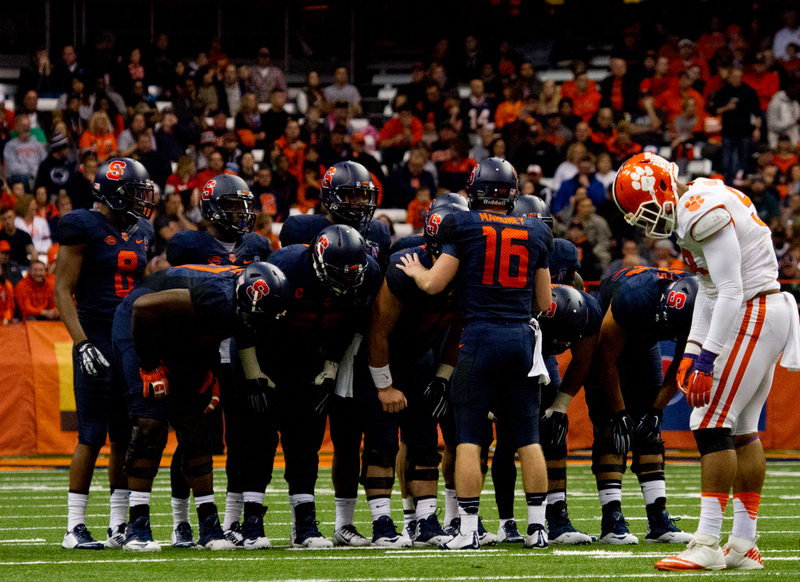 The instruction worked, as the SU defense tightened the screws on their guests. Trevor Cooney dropped in a transition lay-up to take the lead back for Syracuse, then Richardson stepped into an 18-footer from the left corner. Gbinije then provided some punch with a fast break lay-in, a three (which Cooney followed with one of his own), and a pair from the line. The free throws capped a run of 14 straight Orange points that gave the hosts a 22-9 lead with under four minutes left in the opening half. The Mountain Hawks got a pair of free throws to stop the bleeding, but Cooney dropped in a three in transition, then freshman Tyler Lydon got ahead of the defense for a two-handed slam off a nifty Richardson pass into the lane. Lydon then added a pair from the line on the next possession to push the SU lead to 18 points with less than a minute left in the half. Lehigh added a free throw to their total, but Kaleb Joseph swished a three-pointer off the left wing as the clock slid to two seconds left, closing the opening half’s scoring and giving Syracuse a 32-12 lead at intermission. After the two teams traded a couple markers in the opening minutes of the second half, the Mountain Hawk defense became more aggressive. The defensive effort helped trigger a spurt of six consecutive successful offensive possessions in a three-minute span. When the damage was complete, Lehigh had rolled up a dozen unanswered points to pull within 36-30 with 12:35 left in the game. Joseph stuck a triple to stop the Lehigh run, then Cooney hit a bomb for another, nudging Syracuse out to a 12-point lead. Both teams had some offensive issues in the next couple minutes, but Lehigh eventually got scores on back-to-back trips to pull within 47-39 with just under six minutes on the clock. Gbinije replied by drilling a deep trey and Richardson dropped in his fourth three on the next possession. Their marksmanship reinstated the 12-point SU cushion with over four minutes left, giving them a lead that would never be less than eight the rest of the way. The Orange were perhaps too reliant on the long ball in the game, as 34 of their 52 field goals were three-point shots. Trevor Cooney, Michael Gbinije, and Malachi Richardson each hoisted nine tries from deep. Gbinije made a pair as part of his team-high 16 points. Richardson’s four makes were the backbone of his 14-point debut while Cooney made three en route to 13 points. The SU bench provided varying contributions. Kaleb Joseph added eight points while Chinonso Obokoh blocked four shots. Tyler Lydon did a little bit of everything, finishing the night with 11 rebounds, three steals, and two blocks. Tim Kempton paced Lehigh with game highs of 18 points and 12 rebounds. Austin Price was the only other Mountain Hawk in double figures, finishing with a dozen points and five steals. Jesse Chuku contributed six points and eight boards, as well. The Orange have a couple days to do some work before returning to the Carrier Dome floor on Tuesday when St Bonaventure visits for a game. The Bonnies also opened their season on Friday night with a home victory, as they defeated Binghamton, 63-53. Dion Wright led St Bonaventure with a game-high 20 points while Denzel Gregg came off the bench to post a 15-point, 11-rebound double-double. Tuesday’s tip-off is set for 7:00pm Eastern and the game will be televised regionally.